The Barn has its own purpose built, well stocked and fully licensed bar with reasonable pricing. Debit and credit cards are accepted. We stock draught beer, cider and lager as well as spirits, wine, soft drinks and cocktails. Tea and coffee is also available. For full bar listing and prices, please contact us. You are not able to provide your own bar. You may bring your own beverages for reception drinks, wedding breakfast and toast. Winkworth Farm charges a service fee from £9.95* (including VAT) per adult guest. This is limited to a choice of two soft drinks (i.e. Sparkling Elderflower and Orange juice) and one alcoholic drink (i.e. 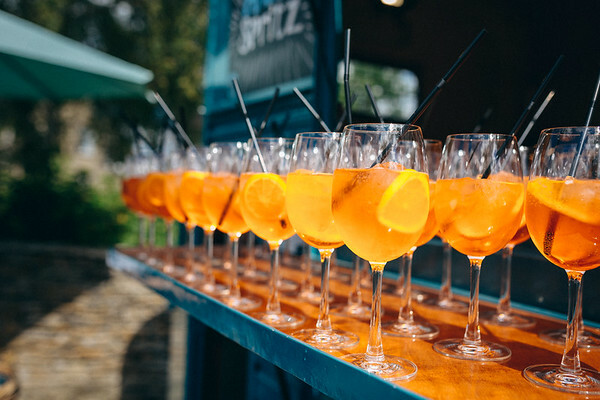 Pimms or Prosecco) for the reception, half a bottle of wine per guest with your meal, and a glass of fizz for the toast. This price also includes the receiving of your delivery at a pre arranged time during office hours, chilling, service, staff, provision of glasses, recycling of used bottles and cardboard and the re-boxing of any leftovers for your collection upon departure. For each additional alcoholic drink (i.e. bottled beers) for The Reception, an extra £1.20* (including VAT) is charged per adult guest. Our fully licensed bar is available from arrival until half an hour before the end of the event (i.e. 11:30pm or 12:30am for additional hour). We offer drinks packages from £19.95* (including VAT) per adult guest. This includes a reception drink (i.e. Pimms or Prosecco) with top up, half a bottle of house wine with your meal, and a glass of fizz for the toast. Jugs of water, one wine glass, a water glass and staff are provided. Please contact us for all drinks enquiries and assistance. SHE’S blue, beautiful and ready to serve you refreshing drinks! 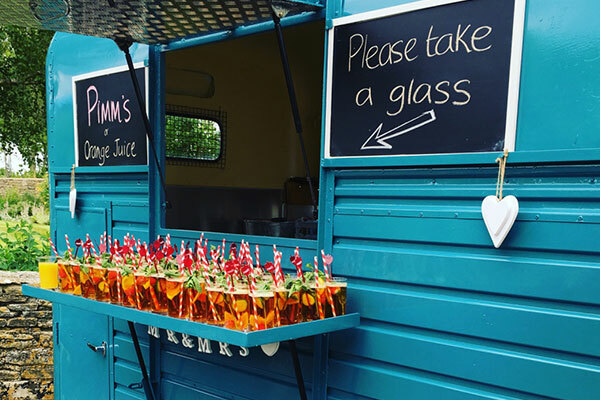 Lillian is a 1960’s Rice Farmers Hunt Horse Trailer that has been renovated into a mobile bar allowing you to wow your guests with something truly different at your wedding reception. 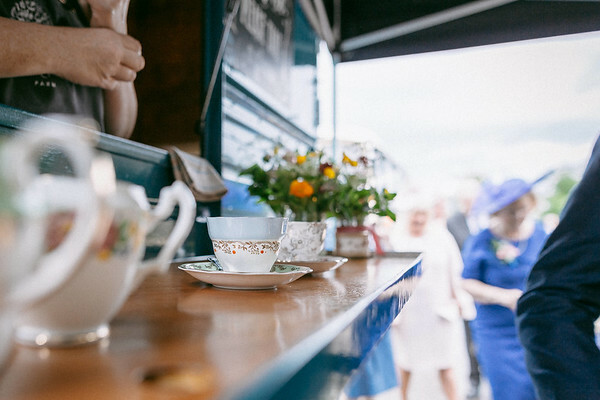 The trailer can be personalised to match the themes and colour schemes of your day and is also a fun photo opportunity. **Please note this does not include drink, which you must arrange with Winkworth Farm. If used as an ice cream trailer, the ice cream is an additional charge. This trailer is exclusive to Winkworth Farm.